Guess what's finally dry and off the blocking mats? That's right, my second Owls sweater! It couldn't have come at a better time too, the weather has gotten so cold that I swear my nips fall off the second I take a step outside! Ooohhh...was that over share? Ack, I don't care! I'm bloody warm now! This sweater has been in major rotation in my wardrobe ever since it was dry enough to wear. It has now become the go-to sweater for when I know I'm going to be outside for extended periods of time...like when I take the Munchkin to the park. Or when I'm pushing a stroller all around the downtown area trying to get as many errands done at once so that I don't ever have to leave the house for a few days. Yes, it's that cold outside. Or maybe I'm just a wuss. Nah, it's cold outside baby! I'm sad to say that my friend Hayley and I didn't get to finish our sweaters at the same time like I was hoping we would. I'm a bad KAL friend! Hayley has been busy with life and didn't have much time to knit on her sweater or to make it out to a knit night. I, on the other hand, have no life and thought it was so unbelievably cold out that it would be foolish of me to not finish the sweater pronto. I should note that Hayley was kind enough to message me and gave me the ok to carry on without her. The funny thing is, I really didn't mean to finish this. Really, I didn't. It was late, I think I was watching Dexter, and this project was hoarding four of my interchangeable cables. I needed to re-claim those cables for other projects. So I sat down with the intention of joining the sleeves to the body and just transferring all those stitches to one cable. Before you know it, I had finished the owls. 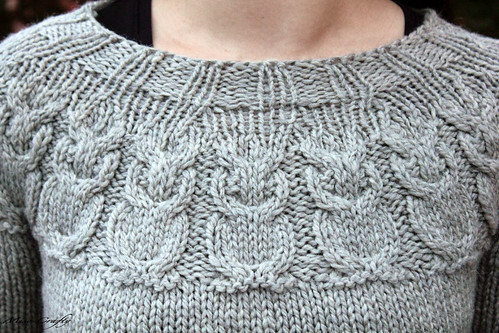 I looked at the pattern and saw that the yoke shaping wouldn't take long to knit up. It would have been stupid of me to stop knitting right there. So I continued on. All that was left was the neck ribbing. Again, being so close to finishing this project, I would have been an idiot to not do the ribbing too. Uh oh. I was done. Just when I was telling myself that I really should stop and wait for Hayley, my hands were already weaving in the ends. I was trying to figure out what I was going to say to Hayley as I was filling up my kitchen sink with water and wool wash. As I gently placed the sweater in the water and was squeezing the air out, I thought maybe, just maybe Hayley was knitting that night and that the next time I talked to her she too would be finished. I looked down. The damn sweater was soaking. No control, I tell you! There's nothing you can do once your knitting is soaking, other than to dry it. And while it's drying you might as well block it, right? Riiiiight?? I know, I know...I'm making up excuses to ease my mind. Anything to make me sleep at night. Ok, not really. While knitting the yoke I could definitely tell that a lot of changes were made to the pattern since the first time I had knit this pattern. You can't see the changes, but they're there. I didn't do too many mods, just extra rounds here and there to add length in certain places without compromising the placement of the back waist decreases. And since the pattern doesn't state what kind of increases to make, I tried using the lifted increases for the back. Brilliant! I love the look of it. I think the lifted increase is my new favourite increase. Oh yeah baby! Thumbholes. Hells yes. I heart them so much! 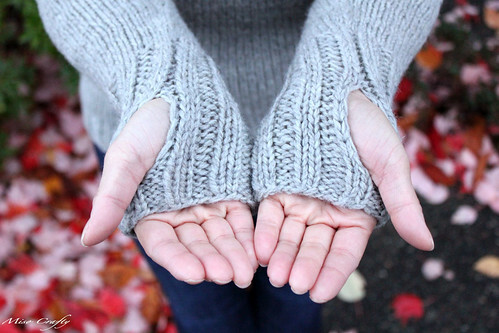 I now want to knit thumbholes in every sweater I make. Every.Single.Sweater. They are just that awesome. Seriously. Pure awesome-sauce. 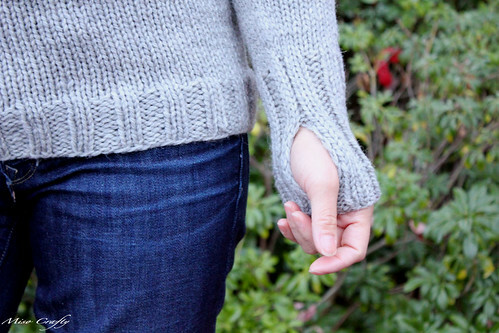 I cannot tell you just how handy having thumbholes in this sweater is. How they have kept me oh so warm during walks with the Munchkin, when I have to push a stroller. How toasty warm I stayed when I put on my gloves and then slide my gloved thumbs through the holes and no cold drafts could ever sneak up my sleeves. Ever. How there's no awkward tugging of the sleeves when I go to put my jacket on. How easy it is to just unhook your thumbs and maybe turn up the cuff a little when you're indoors and don't need the thumbholes. I was smart this time though, I made sure to cast on pretty loose so that I can actually use my hands whilst wearing this sweater without feeling like the yarn is going to cut off my circulation. I once made a pair of wrist warmers and made the bind off way too tight at the hand. They get too annoying to wear any more since I can't even spread my fingers out without injuring myself. I also learned from past mistakes. On my first owls sweater I made the bind off at the neck too tight and sometimes find myself tugging at the neck to keep the sweater from digging in too much. This time I used Jeny's Surprisingly Stretchy Bind Off and I have yet to have a single issue at the neck because of it. I know some people find that bind off way too loosey goosey, but for a tight knitter like myself, it's perfecto. 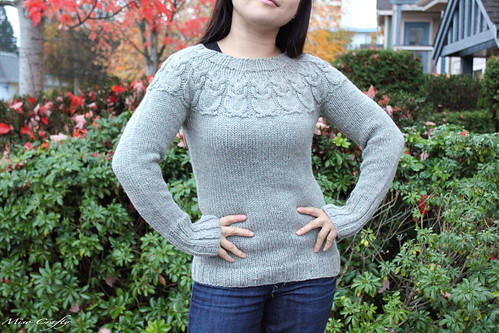 To say that I'm mighty pleased with how this sweater turned out is an understatement. I'm freakin' ecstatic! I love how roomy it is yet still looks slim. I like how the sleeves don't accentuate my "meaty" arms. I thought it was going to turn out too big, but the hooters look totally fine to me. Or maybe I just gained 10 pounds since the first Owls sweater? Ohhh...let's not think about that. This version is so incredibly comfy, that I feel bad for the first sweater. I don't think it's going to get any more love now that this sweater has come along. I heart it so. Did I mention how much I love this sweater?? 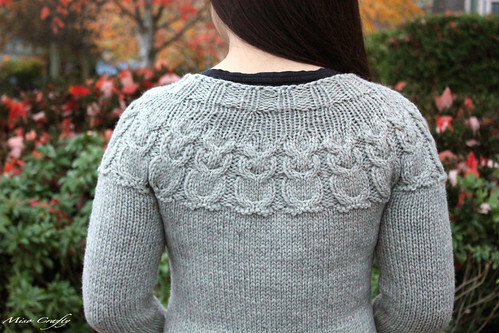 Is it wrong that I want to knit another Owls sweater? I highly doubt you gained 10lbs since the last Owls sweater little miss! Yet another comment on a post that all I can say is "I love it!" I knit one a couple of years ago and also think I would benefit from re-knitting this pattern, so quick and easy and lovely! Perhaps I need to try out some of that Sweet Georgia chunky? !